The 2019 women’s tennis season continues for College of the Canyons with two singles players and pair of doubles teams qualifying to compete at the upcoming regional championships after a successful showing at last weekend’s Western State Conference Singles and Doubles Championships. The team was one of 10 to receive an automatic bye into the round of 16, then took another step towards its championship goal by defeating Santa Monica College’s duo of Dolores Padilla/Iren Feher by an 8-0 score. 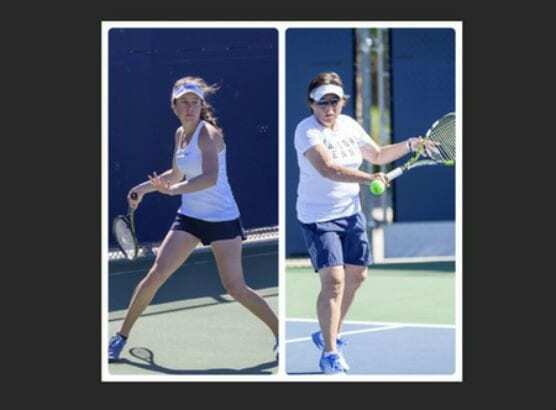 Wambolt, who played at the SoCal regional as a freshman, and Villarta, the current freshman who didn’t play competitively in high school, were a perfect 6-0 during conference doubles play. They entered the WSC tourney as the No. 9 ranked team and received a first-round bye, then lost to the No. 3 Glendale duo of Chacon/Ghazaryan 8-2. Nevertheless, Villarta/Wambolt still move on to the regionals after a series of defaults affecting teams in the tournament’s field. Here are the results for the first match and second match, and the box score. Top photos by Jesse Muñoz & Tony Ramirez/COC Sports Information.